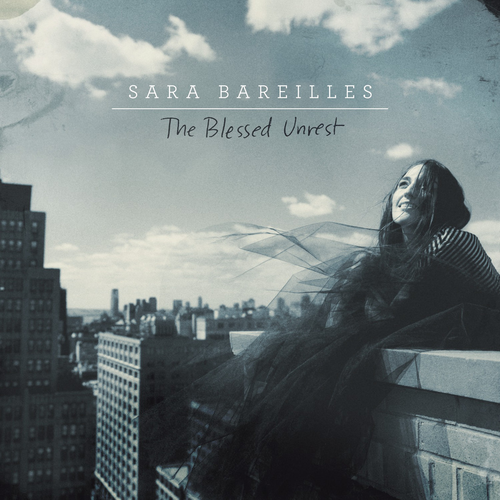 Following up her 2007 debut Little Voice and 2010 sophomore effort Kaleidoscope Heart, piano songstress Sara Bareilles released her newest full-length album on July 13th, entitled The Blessed Unrest. I’m happy to report that the twelve tracks (fourteen on the Target exclusive version) add up to an album worthy of her developing catalog. Here’s some sweet album cover action for you. If you’ve been paying attention to the pop stations, you’ll know that “Brave” is the first single off this new album. It screams of Bareilles’ piano hooks and customary sass. (Seriously. She’s McSassy. It’s delightful.) If the song doesn’t snag your attention, you probably shouldn’t be listening to Sara Bareilles. Just sayin’. My favorite song on the album is without a doubt the pounding rhythm that is “Eden.” The refrain’s taut and fast-paced guitar strums are near-perfect for pushing through a grinding run, broken up by Bareilles’ perfectly harmonized verses. There’s definitely some excellent use of “drum tech” on this track as well. (Thanks liner notes! I can only assume that means digital percussion, judging from the bleepy-bloops I deciphered underneath the legitimate drums.) I honestly haven’t gotten enough of this song since I heard it the first time. Do a few tracks off The Blessed Unrest end up sounding similar to those you have heard before? Well, yeah. But it’s only natural that a single voice against a piano with generally the same accompanying instruments may begin to feel too similar in a third go-round. Still, Sara’s well-crafted lyrics gave me more than enough to differentiate one tune from another. If you’re looking for just fun piano pop, this album may leave you wanting. Sara clearly made a choice to mix in a solid amount of slowed heartfelt tracks. It’s a complete experience, not just a glimpse. And I’m all for it. ← Katy Perry Announces New Album by… Gold Semi?